Η Volkswagen παρουσίασε στη Γενεύη 4 νέες εκδόσεις του Golf R με τις αλλαγές σε κάθε έκδοση να εντοπίζεται στις λεπτομέρειες. Η πρώτη ονομάζεται Carbon Steel Grey, είναι βαμμένη σε γκρι χρώμα και διαθέτει κόκκινες επενδύσεις “Almandine” με δέρμα Nappa. Έχουνε τοποθετηθεί γυαλιστερές ζάντες “Talladega” 19″ με τις δαγκάνες των φρένων να είναι βαμμένες σε πορτοκαλί χρώμα. Πορτοκαλί είναι και οι ραφές των καθισμάτων και των πλαϊνών επενδύσεων. Τέλος ο λεβιές των ταχυτήτων, το τιμόνι και οι πόρτες έχουνε αποκτήσει carbon διακοσμητικά ενώ carbon είναι και τα καπάκια των πλαϊνών καθρεπτών. Στην έκδοση Oryx White, πολλά χαρακτηριστικά είναι ίδια με αυτά του Carbon Steel Grey. Το Oryx White, όπως καταλαβαίνεις είναι βαμμένο σε λευκό χρώμα ενώ λευκό είναι και το εσωτερικό του. Φορά και αυτό 19″ ζάντες Talladega ενώ εξωτερικά έχουνε τοποθετηθεί αλουμινένια διακοσμητικά. Το Aplomb Blue είναι βαμμένο σε μπλε χρώμα και διαθέτει πολλά carbon μέρη όπως οι πλάτες των καθισμάτων και τα διακοσμητικά φιλέτα στις πόρτες. Τέλος το Brilliant Silver έχει ότι ακριβώς και το Aplomb Blue, μόνο που εδώ είναι βαμμένο σε ασημί χρώμα και το εσωτερικό του διαθέτει μαύρες δερμάτινες επενδύσεις Nappa με μπλε λεπτομέρειες. Τέλος και τα τέσσερα αυτοκίνητα διαθέτουν σπορ δερμάτινο τιμόνι και νέα πατάκια. Περισσότερες λεπτομέρειες στο δελτίο τύπου που ακολουθεί. 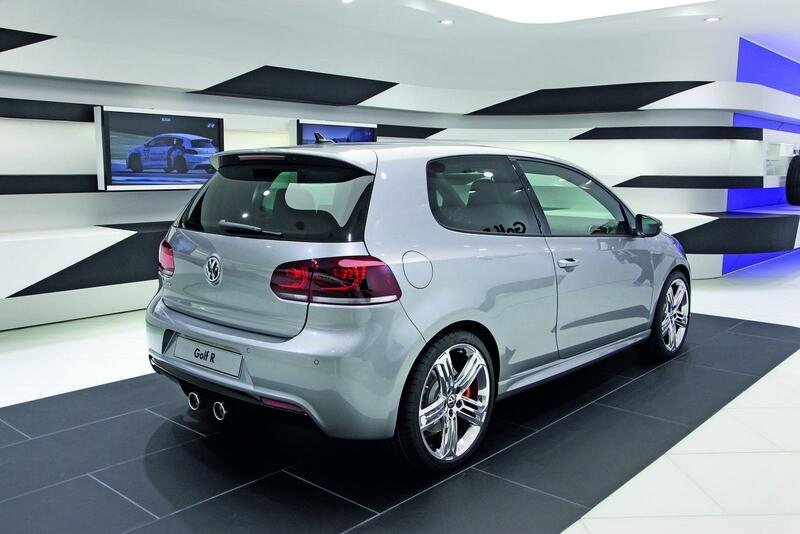 Wolfsburg / Geneva, 01 March 2011 – The Golf R – the top model of the Golf series, is on display in four special versions in Geneva. 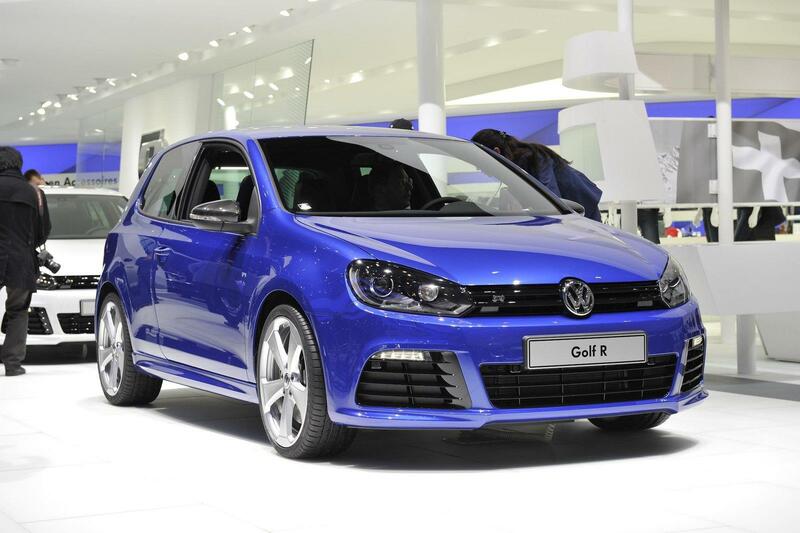 Especially high-end: the Golf R concept cars in exclusive exterior colours and two-tone leather combinations. 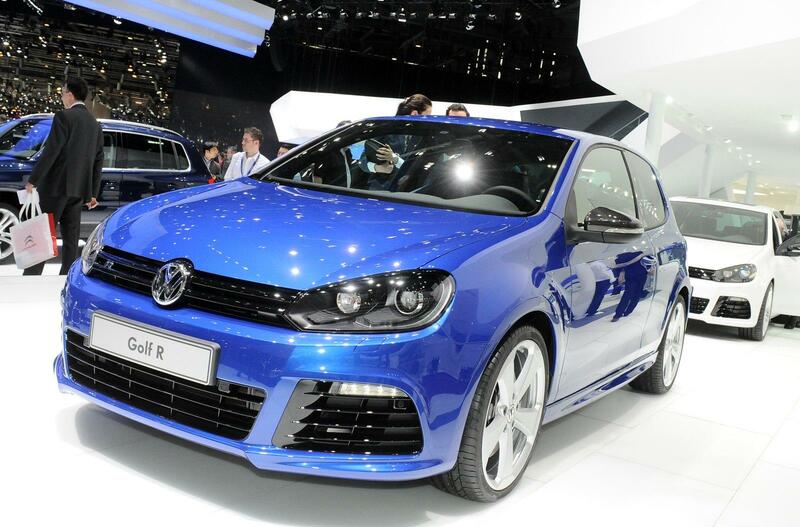 Especially sporty: the Golf R in sophisticated motorsport look with carbon accents. 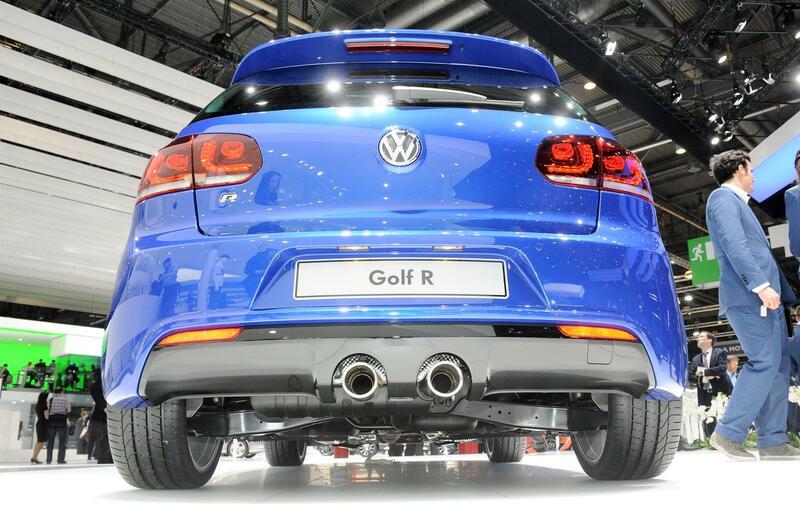 In Geneva, Volkswagen R GmbH is exhibiting four special interpretations of its successful Golf R model. The concept cars showcase the competence of Volkswagen R GmbH in generating contemporary sports appeal. 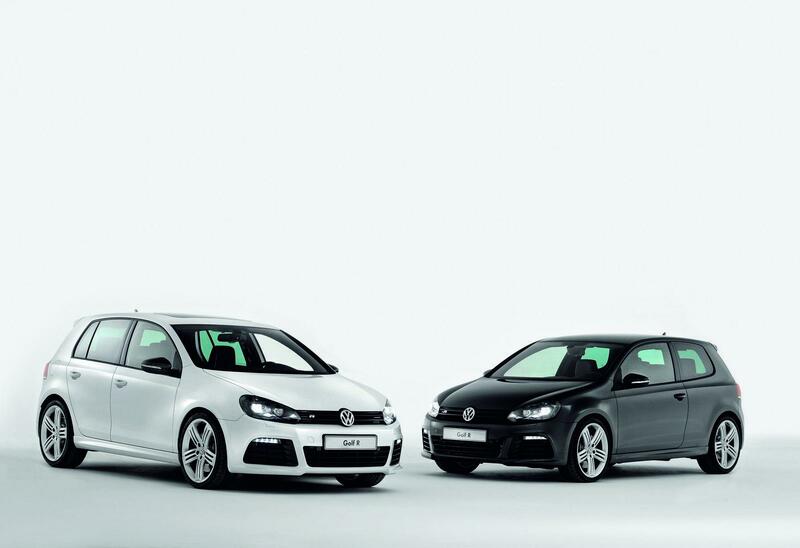 “Based on the high demand and success of the Golf R, we decided to develop four high-end versions of this vehicle,” says Ulrich Richter, Managing Director of Volkswagen R GmbH. 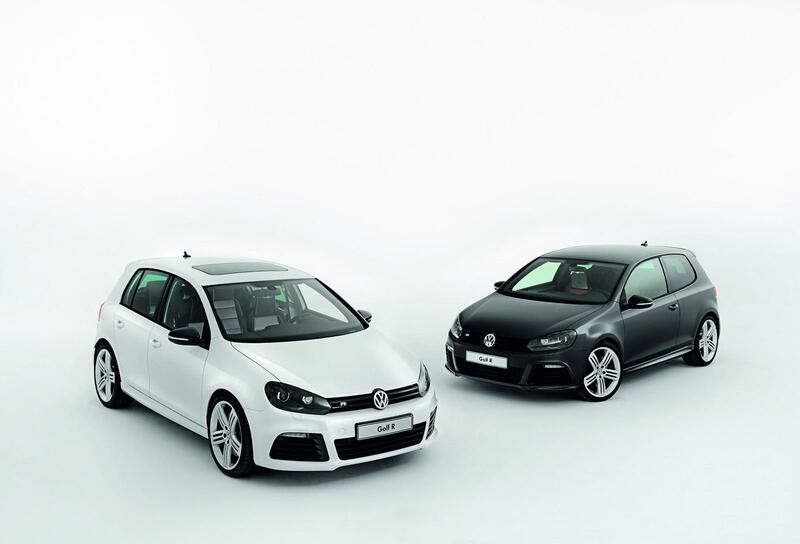 The Golf R versions in the exclusive “Oryx White” and “Carbon Steel Grey” exterior colours – with coordinated high-end Nappa leather interiors – interpret the top model in an especially exclusive way. “Oryx White” is a sophisticated, pearl-effect paint. 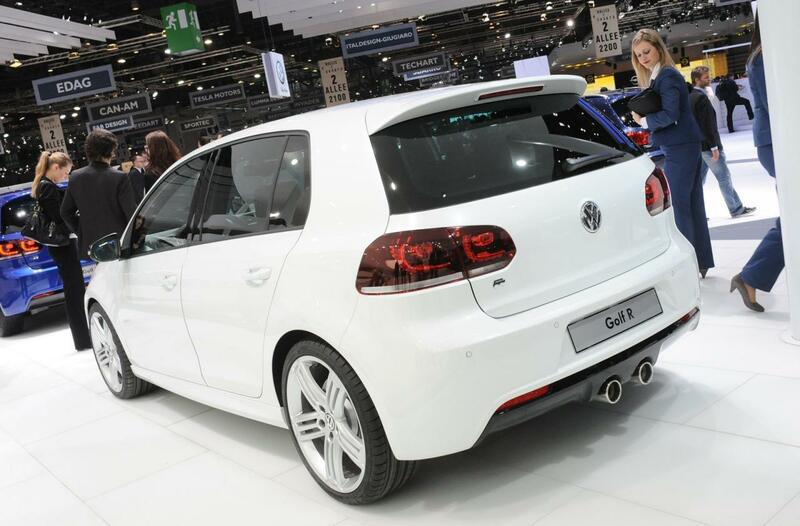 The vehicle rides on 19-inch Talladega wheels, a visual branding symbol of the most powerful production Golf ever. 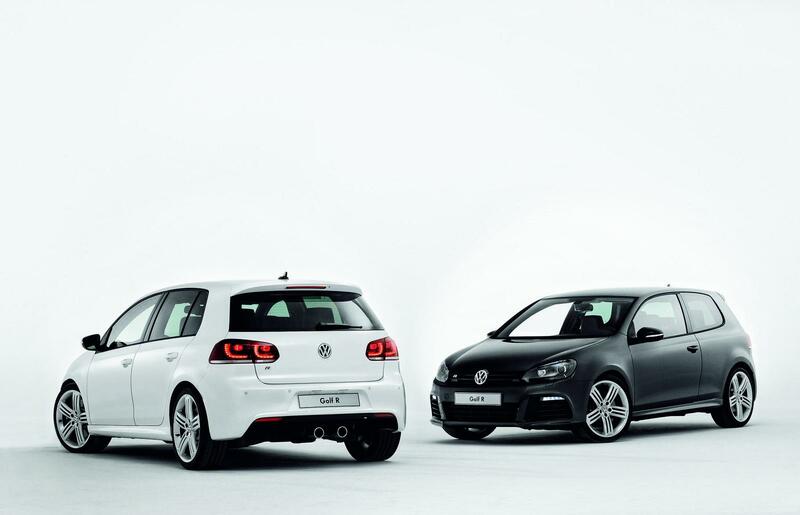 Inside, an elaborately upgraded seat system gives the Golf R its unique flair – this seat system was derived from Volkswagen R’s Exclusive programme. 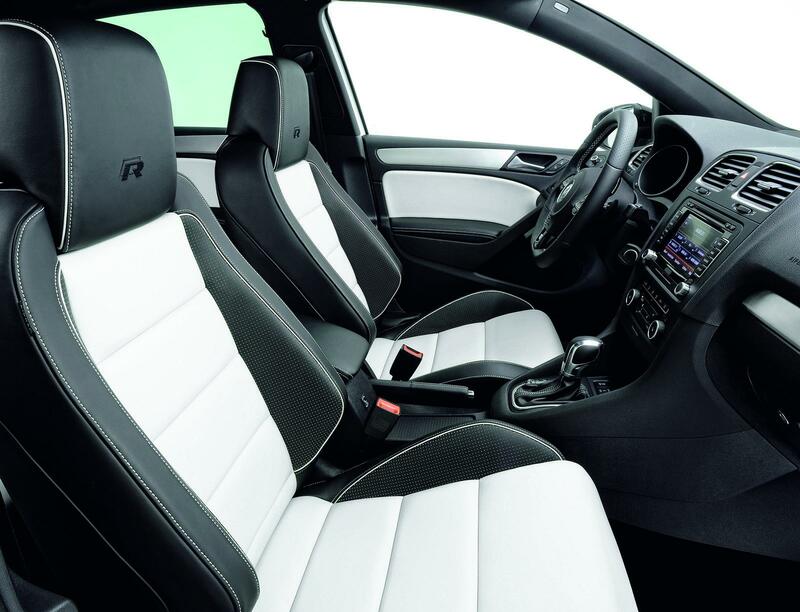 Volkswagen R GmbH has colour-coordinated the centre panels of the front sport seats and the rear bench seat with the car’s exterior by using a light-coloured “St. 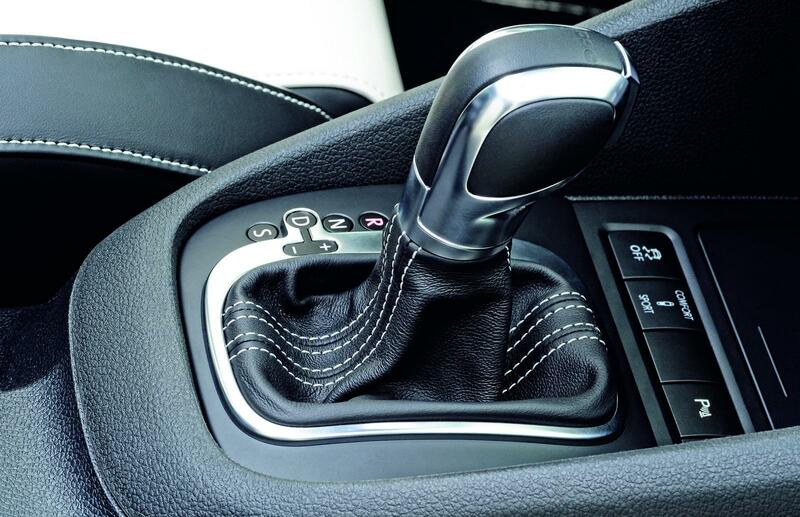 Tropez” Nappa leather; this colour is also used in the door inserts. Lateral seat supports in perforated leather give the seat and seatback an especially sporty elegance. The Nappa leather surface is black, and the perforation creates an exciting contrast to the underlying “St. Tropez” colour. 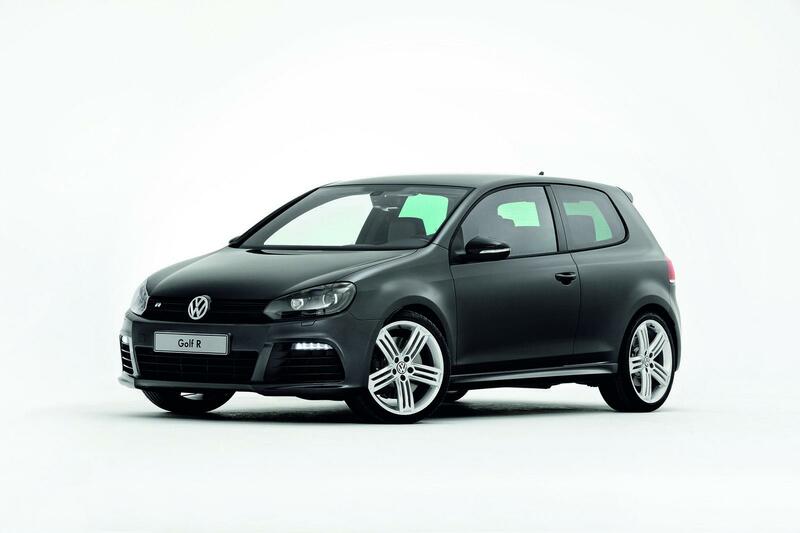 This light colour is also applied to the seams of the door inserts, shift lever and parking brake lever boots and borders of the black floor mats. 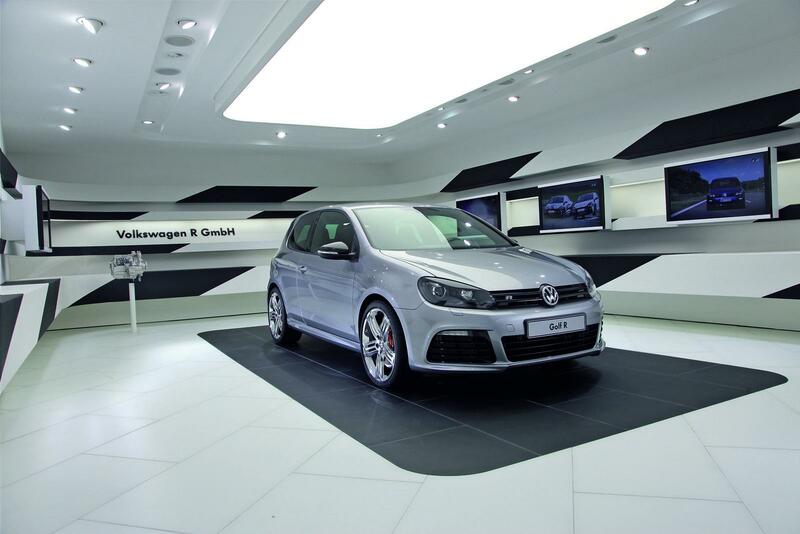 The car has brushed aluminium trim inserts and displays the R logo on the passenger’s side. 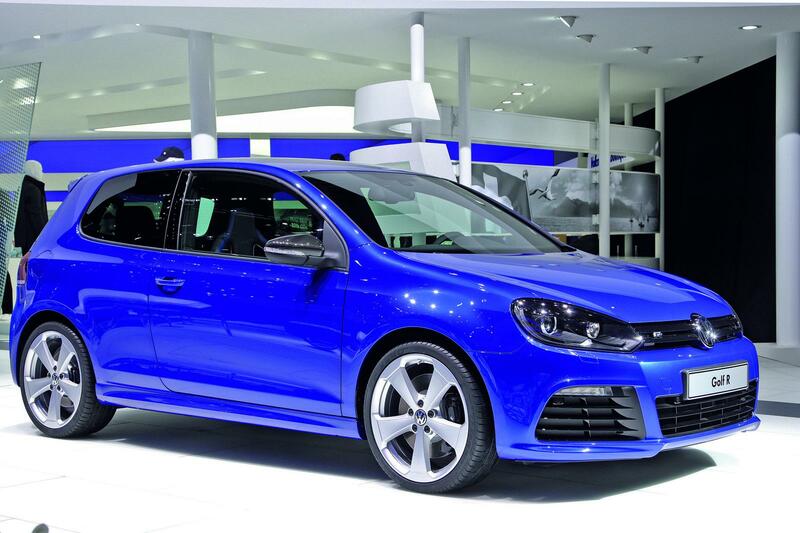 The second version of the Golf R is painted in the exclusive exterior colour “Carbon Steel Grey.” All interior detailing in “St. Tropez” colour in the white version is now executed in the sophisticated dark “Almandine Red” colour here. This creates an especially attractive interplay of colours around the perforated Nappa leather. 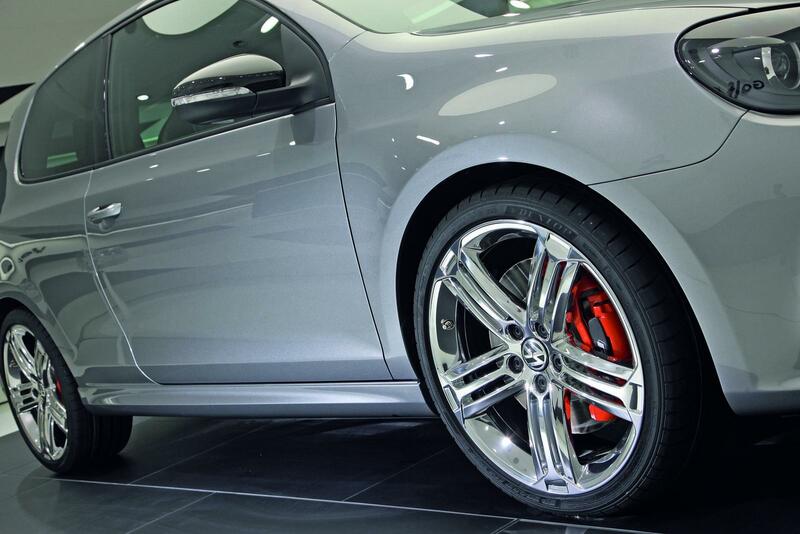 This version also has 19-inch wheels and aluminium trim strips. 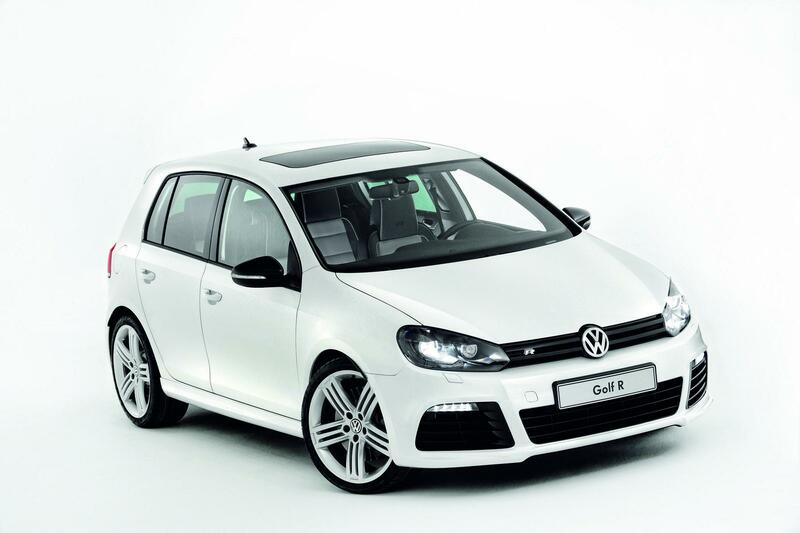 The Golf R being presented in a separate lounge sports an exterior that captivates with its special “Space Grey” (mid-tone grey) colour, polished 19-inch “Talladega” alloy wheels, orange brake callipers and carbon mirror caps. 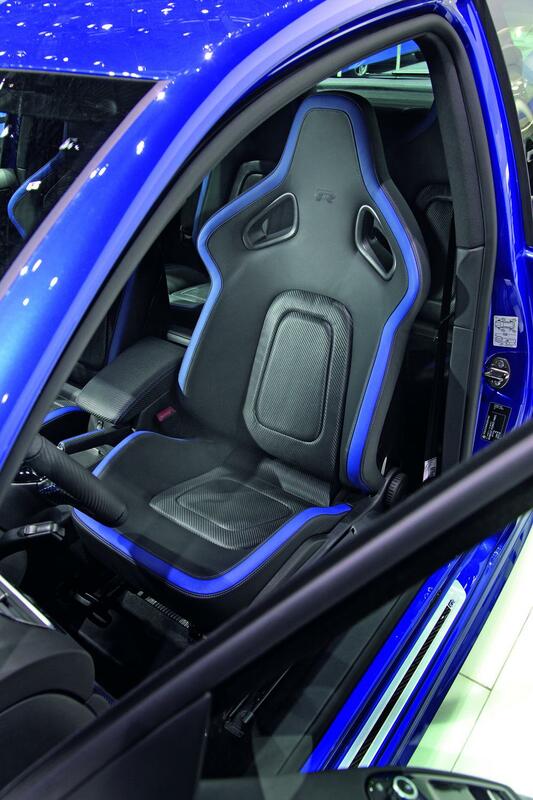 Inside is where this Golf R really picks up speed: the driver and front passenger are treated to motorsport shell seats with ideal ergonomics. They are upholstered in black Nappa leather; around the lateral seat supports toward the inside, as well as in the head section, the seating surfaces consist of anthracite-coloured Nappa leather (“Light Anthracite”). The cross-stitched centre panels of the seats and seatbacks are an even lighter grey (Nappa leather in “Pure Grey”). The back shell glistens in black piano paint. A refined contrast is formed by the piping on the side panels of the seat surface and the head section: the orange of the brake callipers is repeated here. 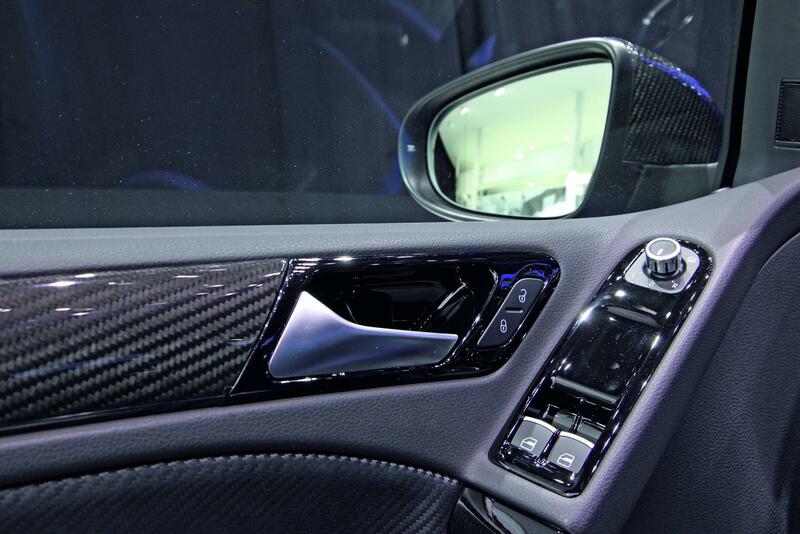 The car’s interior accents match the look of the door mirror shells: carbon. 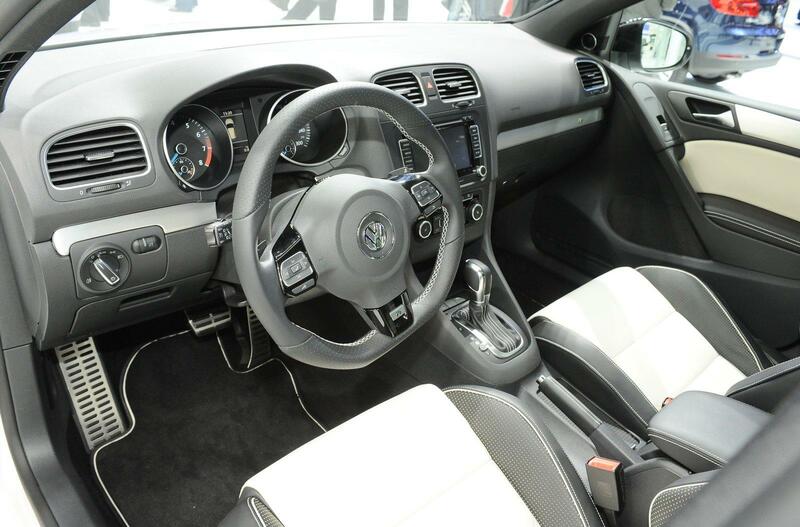 The same material is also used for the steering wheel, gear shift lever, inserts of the leather-trimmed sport steering wheel and the door sill plates. Black piano paint, on the other hand, is used on door panels behind the interior door handles, on electric window switch panels and the panel around the shift lever. 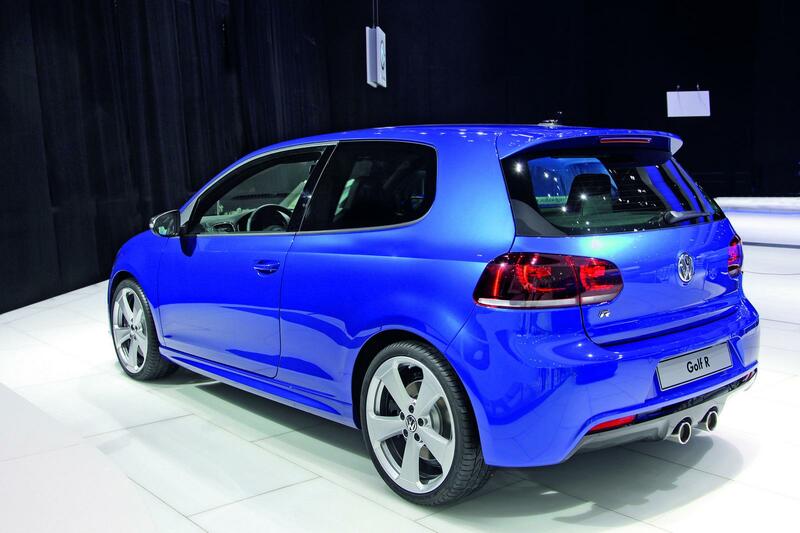 The second vehicle is painted in the high-end “Aplomb Blue.” Its 19-inch “Glendale” wheels are “Brilliant Silver.” As on the Golf R “Space Grey”, the door mirror caps, various interior accents and door sill plates are produced in carbon fibre. The shell seatbacks of the newly sculpted motorsport seats also utilise this extremely lightweight and high-strength material in certain areas. Elegant, black Nappa leather adorns the outer sections of the seat surfaces and backs. The crest of the seats – a wrap-around stripe on the lateral seat supports and seatbacks – is designed in blue leather. Meanwhile, the leather-trimmed sport steering wheel has inner segments and hand grips consisting of what is referred to as carbon leather; it has a characteristic webbed structure of lightweight and precious carbon material. Even the floor mats have a carbon look. Their decorative seams are blue as are the seams around the parking brake lever.